The Great Steak Dad's Day Giveaway | Butcher Block with a Side of Farming! Find us on Facebook. Like our page. Then like or comment or both! on the steak giveaway picture (above) on Facebook. 2 - Big Boy Dry Aged Ribeye Steaks | Thick Cut at 1-1/4"
But hurry! We'll announce the winner Friday (June 15th) at 12noon on Facebook. 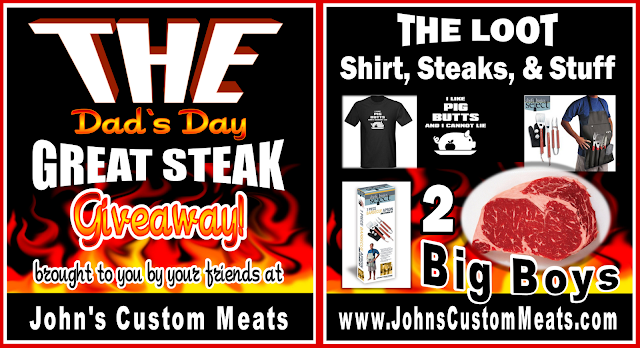 Search for "John's Custom Meats". When our business pops up, just click "vote". Easy Peasy. **NOTE: Some have had problems finding our business on the mission small business page. The search function they use is kinda cumbersome. You have to enter our business name with the apostrophe or it won't pop up. You can copy and paste John's Custom Meats and you should be good to go. Thanks so much for all your support. You are the best! I know this is way past, but definitely gives me some great ideas for next father's day!